We started this tour after spending a few days with friends from Colorado in Carmel. We stayed up later than we wanted last night, getting caught up in an intense game of spades and not going to sleep until close to 2 am. We woke up bleary eyed at 6:30 in the morning, heated up leftovers from dinner two nights ago and did the final bag pack. Took everything outside, unfolded the bikes, and pushed the bikes up the hill outside of the house. Maybe not an auspicious way to start the tour, but it was a steep freaking hill. I’m happy to say that this was the first/last/only hill we weren’t able to ride. We started at 7:30 in a chilly misty rain. There were some rather steep hills coming out of Carmel and Dani had some early doubts about the wisdom of taking on the hills of Big Sur on our Bromptons. 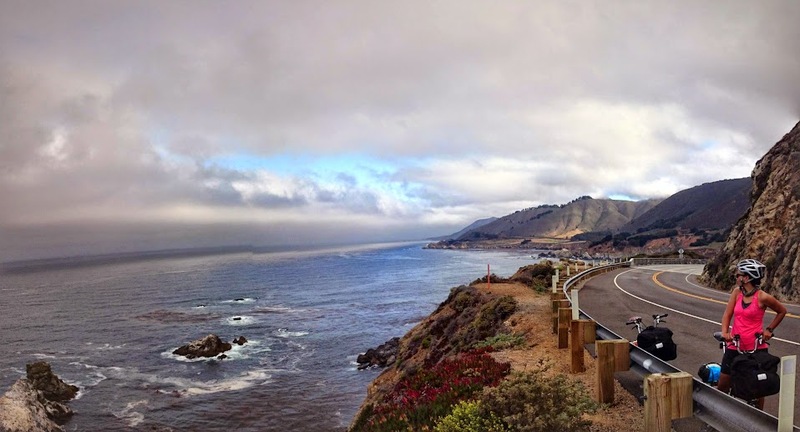 For the first few miles out of Carmel, highway 1 was a busy multiple-lane highway. It subsequently narrowed to two lanes, but it didn’t get much less busy. The ride was up and down, but it felt like more up than down. We passed Point Lobos and Carmel highlands, which had several adorable houses. The rain cleared up after the first hour or so and we had sunshine for pretty much the rest of the day. 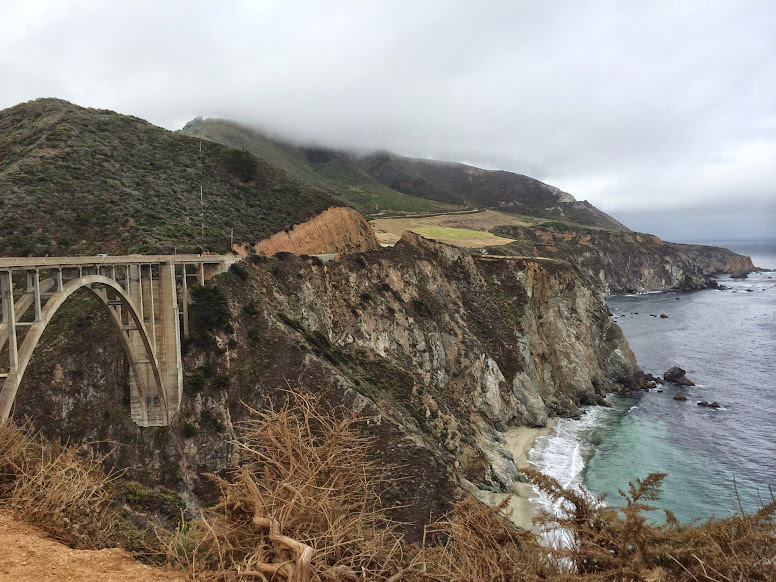 About 17 miles in, we came to the famous Bixby bridge, took some pictures, and met another bike tourist named Ricky. He was heading down the coast to San Diego and then over to Florida… And then maybe to the islands. He was both very smart and articulate and maybe a little nuts. After the bridge, the sun really stated to shine, and after climbing a not-too-bad hill, we had four or five miles through some beautiful fields with mountains on the east and trees in the west. Then we started to enter the forest at the beginning of Big Sur. We rode through small groves of redwood and they were beautiful. There were several adorable lodges and restaurants right along the river. We knew the biggest hill of the day was coming up, so we found lots of excuses to stop. But even our creativity for excuses eventually ran out, so we started climbing. And we climbed and climbed and climbed. Probably around 900 feet of elevation gain. 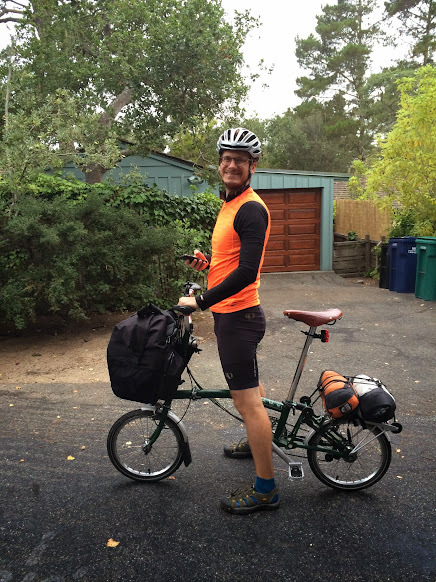 It was tough, but our Bromptons’ easiest gear is a low enough that we were able to make it without too much difficulty. This was my first experience with how having a limited number of gears can actually be beneficial. Where I would normally be trying to find the exact right gear that wasn’t too hard but that would still make me work, I was forced to use the easiest gear and accept the fact that I couldn’t push myself up the hill. It turned out to be a pleasant way to climb. About three-quarters of the way up the hill, I heard Dani screaming less-than-friendly words at someone. It turns out that a motorcycle had cut her off by parking perpendicular to her in the shoulder, forcing her into the lane… in front of a RV. After we reached the summit, we went to Napenthe: a fancy restaurant that charges tons of money for terrible food. Even with the awful food, people keep coming because they want to sit on the deck and see the unbelievable view. We had an $11 steamed artichoke, and two “ambrosia” burgers that came with a “famous secret sauce” that was actually thousand island dressing. The burgers were $18 each. The service was also terrible, and I felt compelled to write a note on the receipt explaining all of the reasons for the poor tip. After Napenthe, we went to the cafe below it, drank some coffee and charged our phones. We had a big initial downhill, but then lots of up and down. After another 10 miles we came to McWay Falls, a thin waterfall that shoots out of a bluff onto the beach and down to this GORGEOUS blue green cove. One of the most beautiful things I’ve seen. On our way out, I made the mistake of standing on a sidewalk that a man in a minivan was trying to use to make an illegal u-turn. I stood, baffled, as I absorbed an incredible volume of invectives cast my way. For the rest of the day, the shoulders were narrow to nonexistent and the hills were constant, but Big Sur might be the most stunningly beautiful area I’ve ever seen. View after view. Turquoise water washing up on white sand beaches backed by majestic bluffs. Whales cresting and blowing in the distance. Amazing beauty. After the area right around Napenthe, we didn’t pass another building for 25 miles, when we arrived at the one-shop “town” of Lucia. We were excited to eat, but the restaurant was closed for the break between lunch and dinner (and the owner refused to even fill up my water bottle), so we ended up paying $6.50 for a frozen burrito and $4 for a coconut water. I guess when you’re the only store for 50 miles, you can get away with a little price gouging. But I encourage anyone in the area to steer clear. While we were busy being denied sustenance, a lady saw our Bromptons and remarked to Dani she had hers in her truck, and that our bikes were really better suited to cruising rather than climbing the hills of Big Sur. It’s always fun to have people tell you that what you’re doing is impossible. Three miles after Lucia, we arrived at Kirk Creek Campground. We set up camp in an amazing hiker biker site right next to the ocean, and met a few other bike tourists (a solo and a father-daughter team). We snacked, played cards, and watched the sun set over the Pacific before hunkering down in our tent (at 8:45) to rest up for the next day. We also saw some whales having a feeding frenzy just a hundred or so feet off the shore. There were lots of blows, a few breaches, and a couple of tail flukes. I had never seen a whale before, so that was amazing. The only downside to the camp is that there was no water, so we spent a few hours trying to track down the elusive campground host so we could pay him $5 for a gallon of water. The first sunset of the trip. ← Welcome to Panniers and Granny Gears!